Arakura yama Sengen Park (新倉山浅間公園の桜) has a great view of Sakura, Pagoda and Mt. Fuji. 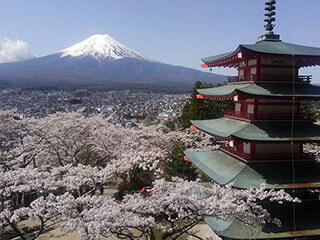 It is the most famous Sakura and Mt. Fuji view in Japan. There are 650 Sakura Trees that bloom in the early April. Sakura blooms in the middle of April. 1. use Fujikyu Line to Shimoyoshida. Arakurayama Sengen Park is one of the most popular Mt. Fuji View point located in Fujiyoshida, Yamanashi Prefecture. It is known as the Mt. Fuji with Sakura and 5stories pagoda. In April, Sakura, Cherry Blossom, bloom and creat the gorgeous view. The pagoda is 19m tall. To the observatory, there are 397 steps. However, the view is worth for it.